The literary-fiction classic Persuasion was written by British novelist Jane Austen. Published posthumously in 1818, it tells the story of a young woman who must adjust to the new situation of her family and manage the unexpected return of a love. Like in the lives of all well-to-do women of the early 19th century, delicacy and drama reign. The ladies in the life of Anne Elliot, a young woman of good standing, are no exception. Due to the sudden shift in family situation, Anne finds herself living with her numerous relations. When an unexpected Captain Wentworth situates himself nearby, Anne does not know what to do with this former love. The drama that ensues with eligible young ladies and prosperous bachelors take the crew to Lyme and Bath where accidents, misconceptions, and rumors are the order of the day. 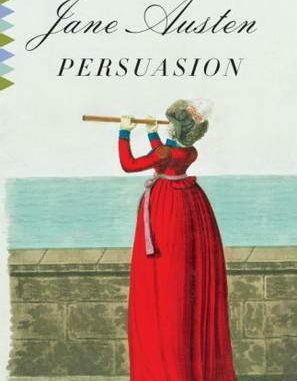 I thoroughly enjoyed Persuasion and undoubtedly will read it again many times. It is a classic love story that gives the hopeless romantic every satisfaction without being too sappy or melodramatic for the general reader.